Tada! For my first recipe published on Tin and Thyme, I bring you some non chocolate baking. Runeberg cakes are a Finnish celebratory cake that was supposedly invented by the wife of poet Johan Ludvig Runberg for him to enjoy every morning for breakfast. How kind of Fredrika. They are made with an unusual mixture of breadcrumbs and ground almonds instead of flour. It’s a great way to use slightly stale bread. I tried this out earlier in the year with this rye bread and blackcurrant cake and the results were truly impressive. When I was browsing through my borrowed copy of Scandinavian Baking by Trine Hahnemann, I noted her recipe for Runeberg cakes and thought they would make an ideal offering for Mother’s Day. My mother is game for anything and likes her cakes to have interest and texture. For the first time ever this year, she made Seville orange sauce instead of marmalade which she was rather upset about. I am the lucky recipient of a couple of these jars. Well what better way to use it than on these cakes; I thought the sweet and bitter flavour would enhance them. The original recipe, tops the cakes with a spoonful of raspberry jam. I, by contrast, poured some marmalade sauce over the tops prior to baking. I also used freshly ground almonds as they give a better flavour. As I made 36 mouth sized morsels, there were plenty for us as well as my mother. The result exceeded all expectations. Crispy outsides made for a nice contrast with the soft and chewy interior. The freshly ground almonds, with their irregular texture gave them real character and lightness too. They had just enough marmalade to make them interesting but not enough to be overwhelming. CT doesn’t like marmalade, but he really liked these Runeberg Cakes. He reckoned they would have inspired Johan’s muse. For another take on Runeberg Cakes hop over to Vagabond Baker. I’m sending this off to Jac at Tinned Tomatoes for Bookmarked Recipes. These are also going off to Treat Petite with CakeyBoi and the Baking Explorer as the theme this month is Mum. 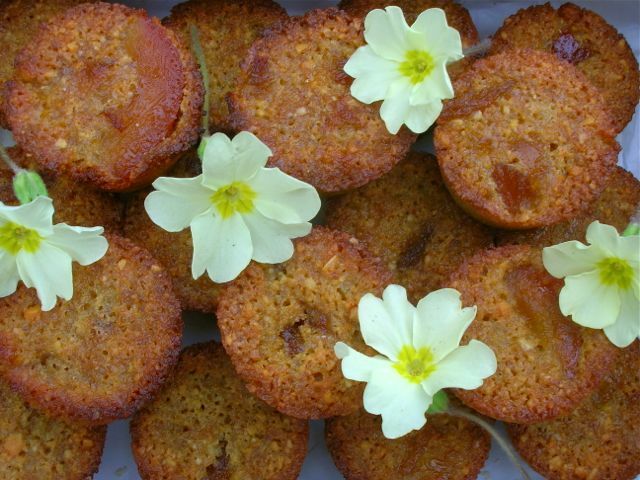 A sticky chewy little cake made with breadcrumbs and almonds which is astonishingly light and very moreish. Cream butter and sugars together until pale and fluffy. Beat in the orange and cardamom. Add freshly ground almonds, breadcrumbs and sieve in the baking powder. Stir together with the crème fraîche until everything is just mixed. Spoon into 36 mini muffin moulds (or in my case into 24, then waited for one batch to be cooked before repeating). Top with a teaspoon of runny marmalade, so it dribbles down the sides. Bake at 180C for twenty minutes or until risen and golden. Leave in the moulds to cool a little then turn out onto a wire rack to cool completely. Traditionally these are not made with marmalade, but are topped with a spoonful of raspberry jam when the cakes are cool. This version makes for marvellously sticky cakes. I love Runeberg Cakes! I was introduced to them in Porvoo, Finland where JL Runeberg lived most of his life. I was given a recipe there and I managed to get round to baking and blogging them the other week. They are so different and tasty! They are usually doused in a liquor syrup that makes them super moist, how amazing would these be with a cointreau syrup! Ah yes, I think I saw them and commented Rachel. Couldn’t quite remember where they were, so now I know I’ll add your link to my post. I was amazed at how light and succulent they were – seriously good. I haven’t changed my name, but I have changed the name of my blog Rachel. Yay for the Runeberg! Haha Joanna – let’s just hope I can find something other than chocolate 😉 Thanks for commenting and so glad you like the site. Wow these are different I must check out baking with breadcrumbs. Congrats on your new space. Thank you Dashing Dom. The cakes are gorgeous and I’m so glad you like the site – it seemed like a big step to take. I’ve never heard of these before but they sound lovely with the mixture of ground almonds and the orange marmalade/sauce. Lovely combination of flavours. Thanks Corina, they truly are rather delicious. I love the light new look C. And I am sold on marmalade and cardamom in cakes too. Thanks Bintu, glad you like it 🙂 I reckon cardamom and citrus were made for each other. Thanks for entering them, they sounds delicious Choclette! They were new to me Karen, but I will be making them again for sure. what a fabulously frugal idea! We also have oodles of marmalade having slightly over done the preserving a few years ago. Please do add this to this month’s Credit Crunch Munch. Ah good idea Helen, thanks for reminding me. Love the new home! Thanks for entering these into Treat Petite Choclette – they are a new one on me!! Thanks Stuart 🙂 These little cakes are really good and well worth a try. Thanks Steph. I was really quite excited by these and will be making them again soon I suspect. The Bookmarked Recipes roundup is live, Thanks for joining in. Thanks Jac, will be over to check it out as soon as I get a chance.